Today was the last day of school! Yay! I think I must be out of my mind for saying that but I'm looking forward to actually being home for long stretches of time. The girls both had a good last day. Both had pizza parties. After picking up Meg I took them to the library, where else do I like to go, to sign them up for the summer reading program. In years past you had to fill out a paper form, were given a folder with all kinds of flyers, and were allowed to pick out a prize just for signing up. Now it's all done on the computer. I'm glad they're saving trees doing it this way but why would I take my three kids to the library to use the computer when I could sign them up in the comfort of my own home when they're in bed? I wouldn't. So we picked out some books and movies. Mattey's library trip was a little more special. 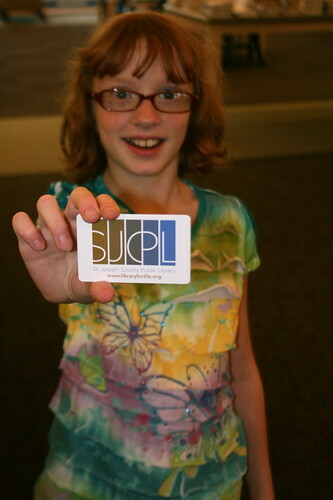 We filled out an on line form for her to get her own library card. She was thrilled. Her card is way cooler than my card. I think I'll have to loose mine so I can get a new one. It'll probably cost me a few dollars but it will be worth it. After I'm done posting I will be signing myself and all the kids up for the program. I would love to win one of the prizes. Two days ago Mattey's new glasses came in. I like them a lot better than the other pair she had. She must have had a growth spurt because her Rx changed quite a bit in just 7 months. Hint--rip the sticker off your old one, they will replace it for free. The librarian told me that. ;) OR wash it, in your pants pocket. It makes the ruining look more accidental.